1st Gear: Chicago-based Groupon — testing America's appetite for bigger online deals — offered its first deal on a new car or truck today at a Michigan dealership. The company, already known for popular restaurant, hotel, and other random store vouchers, launched its first auto dealership deal at LaFontaine Buick GMC Cadillac in Highland Township, Mich. Robert Milner, general sales manager at the dealership, said he was a little reluctant to be the first dealer in the country to try the Groupon deal but likes the idea of setting a precedent. "We're dipping a toe in it," he said today to Automotive News. Consumers spend $199 for a voucher worth $500 toward the purchase of a car, redeemable this year. LaFontaine and Groupon split the consumer's money. 2nd Gear: A two-door, front-engined Porsche GT coupe is being planned as part of the second-generation Porsche Panamera family, highly placed sources have told Autocar. The model is pencilled in for launch after the replacement for the Panamera four-door, scheduled for 2014/15. Porsche is planning the new two-door GT on a short-chassis version of the next Panamera's underpinnings. It will attempt to capture the magic of the 928 coupe from the late 1970s. A new Porsche 928 - possibly badged 929 - would give Porsche entry to a sector that has grown to over 10,000 sales a year, thanks to models like the Aston Martin DB9, Bentley Continental and Ferrari California. Porsche is understood to be planning two variants of the 929: a coupe and a soft-top convertible. 3rd Gear: According to Automotive News, the UAW, including its chief Bob King, are hosting executives from the big U.S. automakers and federal regulators this week to discuss future fuel-economy standards and their potential impact on union members' jobs, several sources said on Tuesday. 4th Gear: The supply of batteries for electric vehicles could far surpass the demand for electric vehicles over the next few years, estimates Lux Research. Lux calls it a "severe mismatch," and one that will cause consolidation, the need for increased partnerships between battery makers and auto manufacturers, and the need for new markets for battery makers to sell into. The big reason for the oversupply? Simple, the market for electric cars is looking like it's going to be a lot smaller than predicted, at least in the short term. 5th Gear: Audi has revealed a slew of mid-life tweaks to the 2011 Audi A5 model lineup. Things like a chrome ring on the steering column stalk, plus new engines and chassis tweaks. All of the engines in the A5's new range - three gas and four diesel - feature direct injection and forced induction, as well as stop-start and an energy recuperation system as standard. CO2 emissions are down by as much as 22% in some models, and fuel consumption has fallen by 11% on average. More here. 6th Gear: I'm here at the launch of the new 2012 Volkswagen Beetle in Berlin. Anything you're dying to know leave in the comments below and I'll try to get them answered. Well, they'll get answered when the embargo is up. 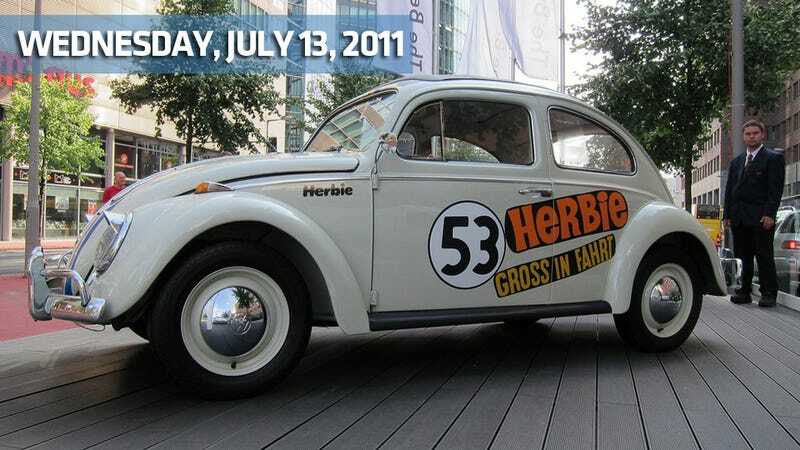 But feel free to caption Herbie Gross in Fahrt ("Rides Again") from up top in the meantime.